Of course it snowed again last night and dipped to 23°. Although it was only a couple of inches, it was enough to convince us to put off the departure until Wednesday, 4/28. That’s actually been our alternative date so it’s not out of line. Spoke to Elaine from the Wells Beach Resort. She psyched for us to get there. It’s opening on the 14th so we’ll try to attain the 4/12 arrival date. The snow melt and runoff has really muddied up our RV parking area so it’s a bit messy. We’re almost done loading the Bighorn. We have the technology aboard, the kitchen stocked, books and tools packed. So we have a few more items. Our intent is to be on the road by 8 AM with an intended destination of Amarillo. It’s 400 miles which is a bit of a stretch, especially for day 1. We’ll keep you posted. We’re on a slow paced glide path now. We took mid-morning break and had a pleasant lunch with Geoffrey and Colette. We used this opportunity to stop at PetSmart to get some Angus supplies. We are also taking our cockatiel (Sammy) with us so we got some goodies for him as well. Since the Container Store was across the parking lot, we looked for some things in there to enhance our Bighorn organization. We lucked out there and walked out with some handy devices that look like they’s work well. 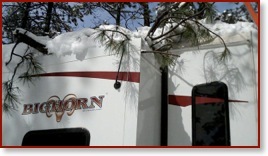 We needed to get the snow off the RV today because there’s serious free coming this evening. The temperature was in the high 30’s and the sun was quite intense so conditions were fine. When i got about half done, Greg, Gwenan, George and Vera came down and Greg hopped up on the roof with me to complete the job. The snow was about 18” deep on the roof and the slides. To add to the effort, it was a typical wet, heavy snow fall. For the most part, we could slide the snow off as opposed to lifting and the task wasn’t too strenuous. When the RV was cleared, we tested the slides and did further inspection and declared a victory. Our Tuesday departure date looked good. 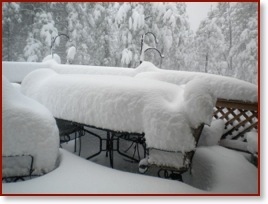 By the time the storm was done, we had 2 feet of heavy, wet snow. It was, by far, the worst storm of the winter. To add to our consternation, when I went out to the RV to do some organization, I discovered that the top of a tree had been weighted down, broken and landed on the top of the Bighorn. The tree was about 8” in diameter and 15’ long. At that point, we had to be thankful that we had gotten so much snow. After we had removed the tree (thanks to Dimas), and shoveling off the roof, the net damage was absolutely 0. 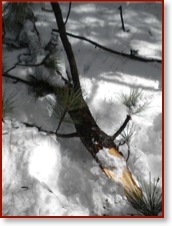 The snow had to have absorbed the potential damage. We also went inside to determine I there were any leaks or structural damage. We tested all the appliances that were exposed as well. A big sigh of relief when everything ended up in fine shape. Although the snow pushed back our departure, it also forced us to cancel a visit to Liam’s birthday party and the associated opportunity to say our goodbyes. Thanks to Skype, however, video calls really makes visiting the grand-children easy while we’re on the road. It adds a closeness that isn’t possible with just a phone call. Dimas plowed a nice path to give us access to the RV and we used this to continue our preparation. Since we had activated the water, we did have to keep the furnace set to a low temperature to avoid any freezing. Last year we got about 6 inches of snow 2 days before we left. This year we woke up to a foot of wet, heavy snow and we’re leaving in 3 (now 4) days. 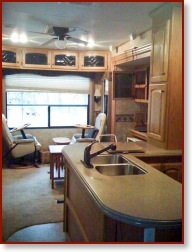 We have gotten a great start on getting the RV stocked and ready but we do have our fair share of work remaining. We have to stock the kitchen, get our clothes, load Maureen’s projects and gather up our technology. I’m actually sitting in the Dodge dealership getting the oil changed and last minute diagnostics run. Had to clean a foot of snow off the truck and plow through the driveway. We need to make sure that it is set for the 3,000 mile trip. This should be a much kinder journey than the Alaska drive. Just going away from the Rockies is significant. In the first 2 days, we drop from 7,500 ft in our driveway to 500 ft in Carrollton, TX. We’re looking forward to bragging about our fuel mileage. Today it is unlikely that we visit the Bighorn, but we we have the goodies in the house ready to go.